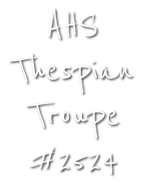 Attending Thespian events is a great way to help! Keep an eye on the calendar for upcoming dates. All proceeds from ticket and concession sales benefit the AHS Theatre Arts program. Items range in price, starting from less than $1. Everything you purchase is shipped directly to the school for immediate student use! Whether it is time, materials, concessions, or funds, we would love your support! Every dollar you donate helps purchase supplies for class and extra-curricular activities, send students to festivals and competitions, and enhances the experience Alhambra High School students have in the Theatre Arts program.